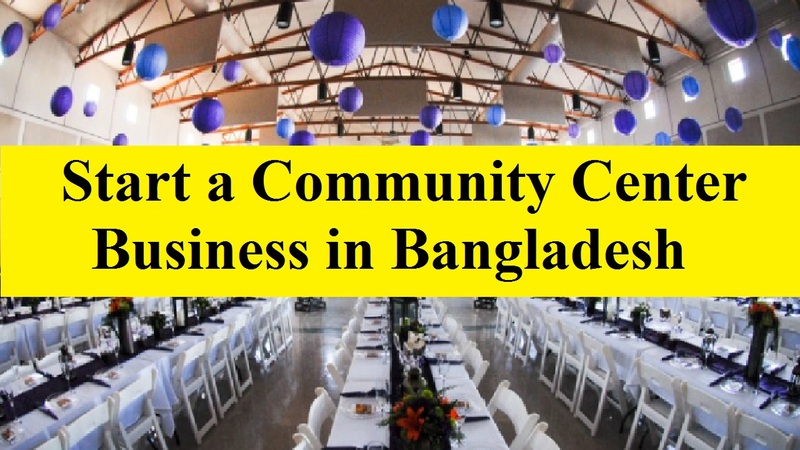 Although a community center is typically a non-profit organization that provides communities with a safe place to assemble and address their needs, we know a community center business in Bangladesh as a good source of profit. But, as it involves years of planning, fundraising, and advertising, starting a community center can be a long process. For a particular geographic area or social group to gather for different types of activities, a community center provides a meeting place and/or an educational focal point for citizens. It’s common to be marriage ceremonies apart from the place to arrange the classes, team sports, movies, and plays. There are some community centers those are privately financed and provide classes for a fee, but some are publicly funded community centers. Marriage is one of the largest events in Bangladesh and as there are not enough spaces to observe the day, the demand for a community center business comes here strongly. Apart from the marriage event, there are a birthday celebration, marriage anniversary, business party, promotional ceremony, opening ceremony etc are greatly needed the community centers in Bangladesh. As the business needs along time along with planning, fundraising, and advertising, the business is not spread over the country. It means that you have a good chance to start this business. Also, it’s a very profitable business like many other businesses. These all are should inspire you in order to start this business in Bangladesh. But, keep in mind that it’s a big one to star community recreation business. Not only it’s that you and your staff get out into the community to spread the word about the awesome resources you’re providing to those who live but work around you as the owner of a community recreation center as well. Also, you should be keeping in touch with community event organizers and set up informational booths. Well, let’s get top 10 tips to start a community center business in Bangladesh. This is very first and foremost one to make a well-researched business plan that will be able to summarize your entire business. You should provide a healthy social base for the community envisioning how it will conduct with local citizens. So, interviews with school administrators, librarians, clergy, politicians, and businesspeople in your town or city to identify the needs of the locals you wish to serve. And you can increase the likelihood that prominent citizens in your area will help make the center a reality being specific about your goals and taking a proactive stance. This is another very important one is to determine what your community center will offer. For example, it offers access to computers from a community technology centers. And in the same way, a youth center gives kids and teenagers a place to socialize and participate in meaningful after-school activities. But, it’s better to set your target as a community center that will serve various ceremony and parties. It depends on the type of community center business whether you should hire paid or volunteer staff. So, make a list of the activities so that you can coordinate schedules and arrange the space to suit each class. For example, it should be removed for Tuesday’s marriage ceremony that of the Monday’s tutoring. It’s appropriate for your clientele when you purchase office supplies and furniture and decorate the community center. One of the goals of your new recreation center is to gain new members that are safe to assume. Also, consider finding out the better way to do that than by offering special discounts. Or, it’s unique to your recreation center if you could even offer special savings on exercise classes, party rentals, and other services. Why not use it to promote your recreation center as social media has a huge impact on the everyday lives of people everywhere? If you run special promotions, you can encourage Facebook, Instagram, and Twitter users to “like” or “follow”. When someone takes the time to follow your page and encourage participation with photo or trivia contests, you should offer “online only” coupons for those that. It doesn’t mean you can’t also plan a special open house event a few weeks later because your community recreation center is already open. Still, the chance is to remain unknown to some community members. In this case, you’ll get help from an open house event. Also, it’ll help encourage people to come out and see it for themselves. Moreover, you should use the social media to promote your open house events. Being a partner with local organizations is one of the best things you can do after the opening of your new community center business. And it’s also a great way to initiate good relationships with other organizations while offering sponsorship programs. Everyone would be thrilled if you’re awarded $3-million to build the community center. But, without some real, most of them are vocal opponents. When you undertake any community-wide project be prepared for criticism.